Want to host a big game party but have a not-so-big budget? With some strategic planning and shopping, it’s easy to throw a game-watching celebration that won’t break the bank. Here are some ways you can score a touchdown of football fun on the cheap. One great benefit active duty military are entitled to is the privilege to shop at the commissary. Commissaries are run by the Defense Commissary Agency (DeCA) and sell items at cost. This can add up to significant savings for consumers. According to a We Are The Mighty article, the average savings for consumers was 23.7% when compared to prices at commercial grocery stores. The commissary can be a smart place to stock up on food and other items typically found at supermarkets. Visit Commissaries.com to find the commissary nearest you. Use your military status to your advantage and shop at arts and crafts stores like Michaels, A.C. Moore Arts & Crafts and Jo-Ann Fabric and Craft Stores that offer military discounts. Check out these stores for football-themed decorations or the supplies you need to create your own game-winning masterpieces. Have a big game party on a small budget. Use your military status to your advantage and look for military discounts when shopping. Football water bottle wrappers – Dress up water bottles with these free printable wrappers. You can also print them out and link them to create game day garland. Mini megaphones and foam fingers – Get everyone into the spirit with these easy-to-make family-friendly props. Football-inspired mason jars – Turn inexpensive mason jars into fun and functional containers for straws, utensils and more. Avoid fumbling on your food budget by serving snacks and meals centered around seasonal fruits and vegetables. Out-of-season produce will always cost more – and probably won’t be at the peak of flavor either. Some of the fruits and vegetables that are in season during the winter include brussels sprouts, butternut squash, sweet potatoes, kale, kiwi, pear and oranges. Of course, what is considered seasonal can vary depending on where you live. The website Seasonal Food Guide has an interactive guide where you can choose your state and the time of year and find out what produce is in season near you. Learn more about how you can spend less by purchasing seasonal fruits and vegetables and read this Omni blog and watch our video. Supermarket News reports that coupons saved consumers $3.1 billion in 2017. If you are making a purchase for your big game party, whether at a brick and mortar store or online, do your research and see if there are any coupons available. Saving $1 here and 50 cents there may not seem like a lot but it can all add up. Depending on the store, you may be able to use the coupons in conjunction with a sale for a double dose of a discount. And remember – commissaries also accept coupons so you can really rack up the savings! Not sure where to find coupons? Here are some tips from Omni. Football is all about teamwork and you can use teamwork for your party too. Encourage all your guests to bring an appetizer, drink, main dish, side dish or dessert. You’ll save money, stress less and everyone will be able to share their favorite foods, signature drinks and special treats. 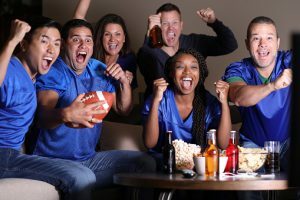 By using these tips you can have a super fun and memorable football party and be the money-saving MVP! All military discounts require proof of military service. See individual websites for details, restrictions, expiration dates, and other information. Offers and discounts can change at any time. Omni Financial does not endorse, recommend or imply affiliation with the listed companies or organizations.